Tim Morrison, always pleasant as he speaks to us in the workplace. 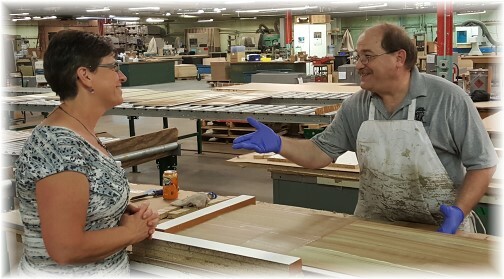 He is supervising a team of workers who spread glue (as seen on his apron) on panels and then attaching various flooring patterns for display in retail stores - not an easy or pleasant job but someone has to do it and he does it very well! "Serving Out Of The Spotlight"
Message summary: In our view the vast, vast majority of work being done for God is done by ordinary people doing ordinary things out of the spotlight. Tuesday afternoon we visited with Tim Morrison (photo above), an employee at White Oak Display. He was excited to tell us about his previous week's ministry when he served as a speaker at a summer camp. 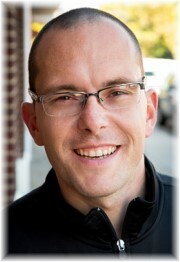 Tim has Bible College ministerial training and has served as a pastor in the past. He now works as a supervisor, usually making displays for flooring companies. He's a few years younger than us but we are always heartened to talk to him due to his vibrant servant's heart. He sees his ministry right where he's at, as well as serving in his local church and other opportunities that arise. He's certainly not in any spotlight and that's not what he seeks. This week I listened to a podcast on "Breakthrough Pastors" with Doug Black who has an interesting ministry as a purposeful bi-vocational pastor in Philadelphia (he's also a web designer). He makes an interesting point. "There are a lot of people trying to grab the spotlight in our world. The platforms that have no spotlight or that are far away from the spotlight are always empty so we need to find God right there." I believe Doug is saying, look for ministry opportunities that don't always have the spotlight on them. When we were young and just beginning ministry we recall being challenged many times to "do something great for God". That was over 40 years ago and life is continually transitioning day by day, year after year. I don't imagine any objective analysis of my life up to this point would warrant a claim that I've done anything really great. I've never pastored a large or nationally known local church. I never gained fame as a worldwide evangelist such as Billy Graham or D.L. Moody. For sure my name is not associated with recording artists! As a writer I don't have any published books or best-sellers although I find satisfaction in preparing these daily messages since 1996. This, along with my service as a chaplain to some 500 employees in various companies, is now the way I serve and of course Brooksyne and I share both of these ministries together. We have appreciated gracious feedback over the years indicating that we have touched people's lives but certainly make no claim to greatness or being in any spotlight. The aspiration to do something great is commendable. Yet a sense of unworthiness can sweep over a person, who, after an honest assessment of their giftings or lack thereof, realize they're simply unable to accomplish anything reckoned as great by others. Many have dropped the baton of service when their aspiring dream never fully materialized. They could only imagine worthiness of ministry if serving in a big way or in the spotlight. We propose another aspiration that may initially seem rather uninspiring: "do something ordinary for God!" All of us can do that and faithfulness in the ordinary really does matter. In our view the vast, vast majority of work being done for God is done by ordinary people doing ordinary things out of the spotlight. Let us consider the daily verse, written to a group of people "The Hebrews", none of whom we know by name. But as part of the Holy Scriptures we can read this verse applying it to our own lives. "God is not unjust." That's a simple four word phrase we do well to memorize. Unjustness permeates our world and at times God's ways don't make sense, even tempting us to question His justness. But the infallible Word of God proclaims, "God is not unjust". "He will not forget your work." Others may forget or not even notice, but God always sees and remembers! "And the love you have shown Him as you have helped His people." How do we show our love for God? Surely through our praises, thankfulness, obedience and in many other ways. But this verse specifies a way that goes to the very heart of ministry and it's generally demonstrated in ordinary ways. In some wonderful way as we help and serve God's people, we are actually helping and serving God. Jesus said, "I tell you the truth, whatever you did for one of the least of these brothers of mine, you did for me" (Matthew 25:40). "And continue to help them" The writer of Hebrews was confident that this help was active and ongoing, as he finished the sentence with this phrase. Are you in active service for God and His people today? If so, keep it up. What a great blessing long-term, faithful, and dependable workers are in the kingdom of God. You may not be in the spotlight, in fact it's likely you're not. 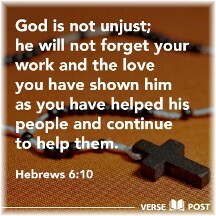 But He sees and will not forget your work. He generously rewards us in this life but His greater reward will be given in the life to come! Today do something ordinary for God so that He will use it for His extraordinary purposes. Daily prayer: Father, as You call us You also equip us to do that which You lay upon our hearts. May we respond to those in need in whatever capacity we can help. Certainly we can pray, we may need to write or call, and then there are the times we are to go and accomplish that which we are called to do. May our motive, in everything we say, do or think be to glorify You as we shine our light, not for our own glory, but always for Your glory and honor while also spotlighting the good news of the Gospel of Jesus Christ. Amen. I want to tell you about someone only a few of our readers will know. I accepted Christ when I was a teenager and attended a small church in Independence, Missouri. Through the years I kept up with my first pastor and his wife as they aged. Pastor Howard died about twenty years ago. 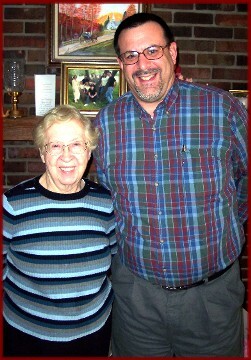 I last visited with Sister Howard in 2006 along with my brother. She insisted on taking us out for ice cream, which gave us an opportunity to thank her for the impact she and her husband had on our lives. They were great examples as they demonstrated Christ's love and total dedication to the flock. Here's a photo of Sister Howard and me taken during that visit. She and her husband are a vital part of my spiritual heritage. Several years after this visit I tried to call her but got a recorded message that her phone had been disconnected. I had a sense that she may have moved on to her eternal destination. On a hunch I typed her name and "obituary" into the search engine and sure enough she had passed away at 91 years of age. Her obituary had this descriptive statement, "As a minister for over fifty years, a published author and a teacher, she devoted her life to sharing the gospel of Jesus Christ with others." Do you know that you can, from your own home, minister and help change hearts in foreign countries? Through simple email correspondence you can become a GlobalFriend and reach people for Christ in countries where the Gospel is very restricted. Door of Hope International can provide you with a name and email address to begin your email correspondence. We have hundreds of names and email addresses from people who live in Muslim countries waiting for a “PenPal.” They want to improve their English skills and learn about Western culture. This is a great opportunity for Christians in the West to develop a friendship and share their faith in Jesus Christ with their new PenPal from the Middle East, Asia, North Africa, or the Gulf States. It doesn’t cost you anything but a few minutes of your time. You must believe that Jesus is the Son of God and salvation is found only through Him. You must be proficient in the English language. For more information click here and fill out the online application to become a GlobalFriend today! * Paul is not to be confused with Peter Popov! Paul is the son of Haralan I. Popov, a prominent pastor in Bulgaria, who was arrested and falsely accused of “being a spy” for the United States and Great Britain. Pastor Popov spent 13½ years in 16 Communist prisons and concentration camps for his uncompromising faith in Jesus Christ. His prominence as a devote Christian leader brought him severe physical torture at the hands of the Soviet KGB and their Bulgarian quislings. His amazing testimony of Christian courage is recorded in his autobiography, "Tortured For His Faith" (Zondervan Publishers). 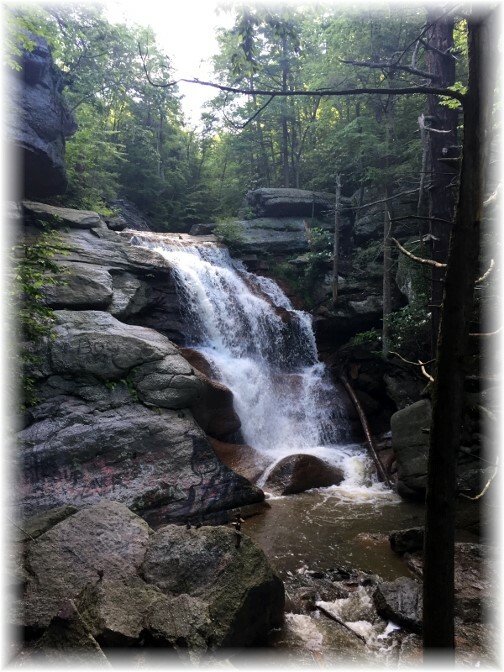 Our friend Phil Huber from "Your Hearts Delight" shared this photo of Swatara Falls he had taken this last weekend. These falls are in a remote location but not really that far away. For local readers here is some information and location on Google map. It's interesting that it is very near to some large surface mines. For local readers: This coming Sunday evening, July 23, The Triumphant Quartet will be in Lebanon, PA for the Music In The Park summer concert series. See here for info. This is a free concert! (A free-will offering is received). We plan on attending with our long-time friends Ken and Nila Pierce and their children.